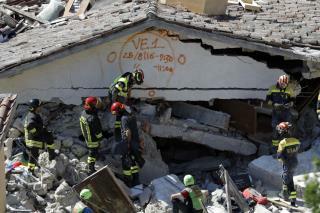 (Newser) – After what the AP terms a night of "uninterrupted search efforts," the death toll in central Italy has risen to 247, the number steadily inching toward that of the devastating 2009 L'Aquila quake, which killed 308. The tiny towns of Amatrice and Accumoli were the hardest hit and claim the lion's share of the casualties. "Unfortunately, 90% we pull out are dead, but some make it, that's why we are here," says a volunteer in Amatrice. One firefighter who came in from Rome to help says around 15 survivors were found in Amatrice overnight. "There are no words when that happens." Amanda Knox will be charged?